Add a more old fashioned appeal to your holiday décor this Christmas when you purchase these knit argyle/ snowflake stockings for every member of your family. 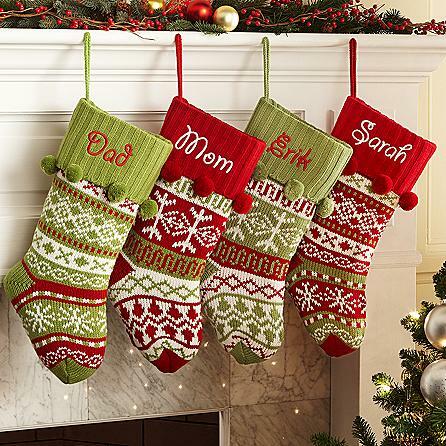 These old fashioned sweater style stockings are certain to draw out a little bit of Christmas spirit in everyone this holiday season when you hang them from your mantle. Created from 100% high quality polyester, these unique stockings are carefully knitted with your choice of an argyle design or a snowflake design, and are certain to become a lasting addition to your holiday traditions. Each stocking includes a wide cuff that is decorated with adorable snowball fringe and can be personalized with any name, nickname or sentiment you choose (up to 12 characters). Choose from four design/ color combinations including green and white snowflake, green and white argyle, red and white snowflake or red and white argyle. Be sure to order extras for when new family members arrive!